OSHA Compliant Certification Made Easy! OSHA Compliant Certification Programs – Online training is here to stay. The U.S. Occupational Health and Safety Administration (OSHA) is responsible for ensuring safe work practices in a variety of industries. Transportation, telecommunications, warehouse distribution, natural resources – whatever the industry, OSHA helps to maintain a safe working environment for millions of U.S. workers, contractors, and laborers by setting strict standards for safety and training, through OSHA certification online programs. Forklift safety is just one part – a very important segment – of OSHA’s total safety program. The organization oversees every type of industrial machinery in use, including forklifts. To keep workers safe who are involved with forklifts at work, OSHA has created a number of regulations and rules for forklift training that all employees and employers must abide by. Learn more about these requirements below, and how to get the OSHA training online that you need. If you’d like to know how to become OSHA certified online, you’ve come to the right place! CertifyMe.net offers OSHA certification online for any forklift driver. Whether you’re just starting out as a forklift operator, or need to complete your OSHA forklift certification online, we have everything you need to become a safer – and better – forklift driver. In OSHA’s official capacity, forklifts fall under the category of “Powered Industrial Trucks.” Since forklifts are used in a vast operating capacity, certain work environments place different or added emphasis on safety. For instance, a dockyard forklift working outdoors in the winter will have distinct safety requirements, while forklifts primarily used in a retail or indoor distribution setting will have different hazards and safety protocols. According to OSHA, forklift training requirements consist of three main components: the training program itself, the topics taught, and renewal training. Do all these requirements sound overwhelming? Not to worry! CertifyMe.net offers the OSHA training online for forklifts you need to completely fulfill OSHA’s requirements. Our courses include all required topics, components, and come with free three-year renewals for life. Everything you need to be compliant with OSHA regulations is built into our easy, online courses. With better safety awareness and a complete understanding of the latest OSHA safety standards, everyone will immediately benefit! Employees will be safer on the job and more likely to prevent accidents, and employers won’t be at risk of costly fines and potential legalities. Complete content. With OSHA certification online classes for different types of lifts, you’ll enjoy a customized learning experience, including everything you need to know. 24/7 convenience. Login to your OSHA forklift certification online class when it’s convenient for you. With CertifyMe.net, there are no set schedules – you complete the training on your terms! Affordable pricing. Forget expensive 3rd party training solutions. We offer OSHA certification online for less! Check out our course pricing today to get started. Our OSHA-compliant training classes offer a comprehensive review of the most crucial safety practices. And because CertifyMe.net offers a 100% OSHA compliant training course online, you’ll never have to worry about scheduling off-site meetings, coordinating schedules with 3rd party safety training providers, or deal with all the headaches associated with other forms of outsourced OSHA compliant training. CertifyMe.net works with each client to ensure optimum quality, exceptional customer service and lifetime support. Our online OSHA training program also gives employers and employees the flexibility to learn wherever they are most comfortable. Forget about sitting in a traditional classroom with a monotone lecturer, but instead learn from your laptop or iPhone. Whether you prefer to lounge on your couch or at a coffee house, the OSHA certification online program can come to you, rather than you coming to it! From affordability to convenience, what reason do you have not to invest your time? Register your company – it’s totally free! Register your operator – we offer a secure payment portal for no-hassle OSHA certification online. Student Login – once your operator login and password are established, they’re in our system! One hour online test – our curriculum and training content provides a complete overview of all OSHA forklift certification requirements…online, from anywhere! Print your certification – this is the final step in how to become OSHA certified online. Once the test is successfully completed, the certification is ready to print. It’s that easy! In only about one hour and from any device with the internet, workers can complete their OSHA training online and receive their OSHA-compliant certification. There’s no need to travel to an offsite training facility, and dedicate hours of your time to training. You can complete your online OSHA training in as little as one hour, from home! Each course comes with all necessary handouts and checklists, English and Spanish options, and 3-year renewals at no extra cost. This OSHA training online content helps prevent, detect and avoid the symptoms of heat stress. This includes training on heat rash, heat fatigue, heat exhaustion and heat stroke. With workplaces injuries and fatalities from heat stress numbering in the hundreds (including, on average, about a dozen deaths annually in the U.S.), our Heat Stress Training adds an extra element of safety to your workplace. In order to comply with OSHA’s Recordkeeping regulation (29 CFR Part 1904), this OSHA certification online course covers all the basics, plus some little-known facts about proper recordkeeping. In the event of an accident, OSHA will request internal safety records for investigative purposes. Make sure your records are up to standards – sign up for this course today to complement your OSHA compliant forklift instruction. For more information about our training packages, call our OSHA safety consultants today at (888) 699-4800, or visit the CM contact page. 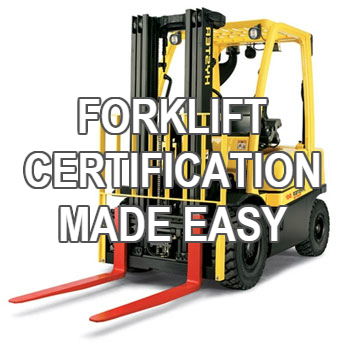 Thanks for considering CertifyMe.net for your OSHA forklift certification online requirements!